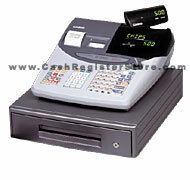 Casio TE-2000 Electronic Cash Registers at Cash Register Store. Replaced by TE-1500. Click here for more info. The Casio TE-2000 is a well balanced intermediate level cash register. Many features found on higher cash registers can be found on the Casio TE-2000, but at a cost that reflects lower cost models. For instance, a full size metal cash drawer with media slot, alphanumeric receipt and journal printer, and the ability to interface with a scanner makes the Casio TE-2000 a very attractive cash register. A 2-station, 14 lines per second, silent and wide 58mm printer offers the option of using the built-in auto cutter or tear bar to generate a customer receipt. The printer also includes drop-in paper loading and graphic and watermark logo printing for professional presentation of customer receipts (w/ optional software).